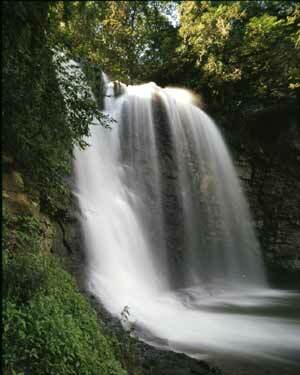 Just south of Hayden Run Road on the west side of the Scioto River is a beautiful water fall called Hayden Falls. Hayden Run (originally called Roaring Run) is a small stream that empties into the Scioto, but before it winds its way down to the Scioto, it drops about 25' over a cliff of limestone rock. The quantity and quality of this cataract depends heavily on the amount of rainfall in the immediate few days prior to your visit. Sometimes it's just a trickle, and other times it is a splendid falls worth the effort of finding. Located just across the Hayden Run Bridge, on the west side, is a small sign and space for a few cars to park. In recent years, the Columbus Department of Parks and Recreation has improved the area with a parking lot, look-out deck and stairs leading down to the valley floor where you can hike back to see the falls. When I first visited the falls back in the 1960s, there were no such luxuries as stairs and you had to climb down a treacherous trail that winded down the side of the steep cliff, but the effort was worth it. Even in the winter, looking at the sometimes frozen falls can be exhilarating. Further up from the falls is a much smaller water fall. Extreme care must be used when walking above the falls. Rock can be extremely slippery and it's a long ways down if you would happen to slip. Above photo was taken during an extremely cold winter a number of years ago when the falls had frozen over. 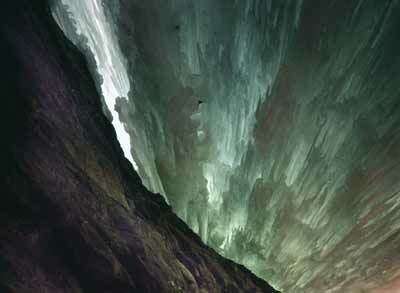 This image was taken looking straight up between the ice buildup and the rock face. 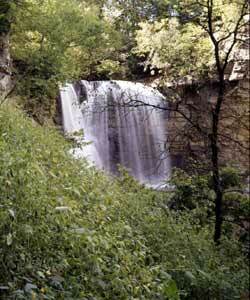 Once you enter the gorge area below the falls, you won't believe that you're actually in an urban environment. The closer you get to the actual falls, all sounds except for the falls are drowned out. Take your time and enjoy the relaxing beauty of this hidden scenic view. Hayden Run was named after Jacob Hayden, an early settler in this area. 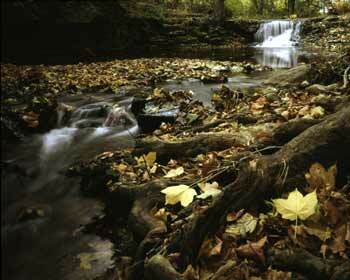 Hayden's Run is the name of the stream that passed through his land.